The SUNY College of Environmental Science and Forestry (ESF) is preparing to welcome the largest entering class in its history. 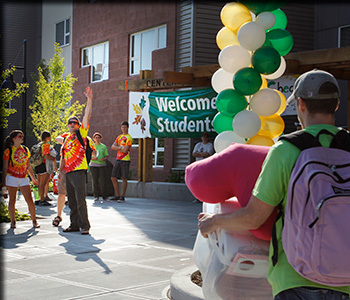 More than 330 first-year students and an additional 250 transfer students are expected to enroll for the fall 2014 semester. Enrollment counts are finalized as students register for fall semester classes, but the combined total of more than 580 new undergraduates surpasses the previous record of 551 set in fall 2012. The entering transfer class will include more than 60 students who are expected to enroll at ESF's Ranger School campus in Wanakena, N.Y. The recent addition of a new degree program in environmental and natural resources conservation has helped to attract the largest number of Ranger School students in many years. Students arriving at the main campus in Syracuse will move into a newly expanded residence hall. An addition to Centennial Hall, which is LEED (Leadership in Energy and Environmental Design) Gold Certified, expands the building's capacity from 452 to 536 students. The college expanded the building in response to student needs for on-campus housing. Twenty-two percent of the entering first-year students and 10 percent of the transfer students will come from outside New York state, maintaining ESF's position as one of the most geographically diverse campuses in the SUNY system. The record class will also set a new standard for student diversity. Twenty-two percent of the first-year students and 10 percent of transfers identify themselves as African-American, Asian-American, Native American, multiple race or Hispanic. Three percent of the first-year students are international students, and 47 percent are women. The "typical" entering first-year student will have earned a high school average of 91 percent, a class rank in the top fifth of his or her graduating class, and SAT college entrance examination scores in the top 25 percent of all students tested nationally. Incoming transfer students also earned strong grades at their previous colleges, averaging 3.15 (B+) on a 4.00 scale. On a graduate level, ESF anticipates the arrival of approximately 125 new graduate students for the 2014-15 academic year bringing graduate school enrollment to approximately 455 students.